In no way do I claim to have a green thumb. But, I have learned a ton in my one whole year of gardening experience (impressive, right ? :). My husband and I joke that we live on a farm. We really just live in a 100 year old farm house on some land that is shared with our landlords, who live behind us. When choosing a house to rent, we knew we wanted some space to begin gardening, but we totally were blessed with a lot more. We actually have two apple trees, about 1/2 an acre to garden on, a grape vine, two walnut trees, and a huge deck for raised beds and planters. Which brings us to today's post: Growing Your Own Food Part 1 - porch/ deck gardening. I want to share with you all what I have learned, and also learn from you too (if you have tips feel free to comment!). I think that it is so important to try and eat food as close to the source as possible- for nutrient density of your food. What closer than your own back yard or porch, right? The easiest first step to make is gardening in planters or raised beds. Raised beds need a bit of construction, however. So today, I will show you some of my "planters" and where you can make/ get your own. 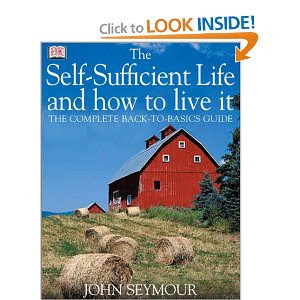 First, I recommend some resources to help you get started: The Self Sufficient Life and How to Live It, by John Seymour, has answered a lot of our questions about urban and farm gardening as well as provided some good tips for self-sufficiency. While we do not follow everything in this book, there is such a wealth of information and tons of pictures- for the more visual learners like me :). Or this site, Sustainable Table, that you can search around in for all kinds of info on what is in season when, finding a farmers market near you (talking to veteran growers at the farmers markets is where we find a TON of tips and info), etc. Finally, Local Harvest is a great place to buy plants and seed from. They will also connect you with local produce growers who have already grown up something from seed and all you have to do is take it home and plant it in a planter with some dirt! We actually got a lot of our lettuces and Swiss Chard from a guy down the street we found on Local Harvest! Herbs- whether you plant sage, parsley, rosemary, thyme, basil, mint, or cilantro (there are many more- these are just the most used I can think of), herbs are the easiest to get started with. Herbs are very robust- especially basil and mint- and can come back every year! Just simply trim them back in the fall when they are done and they will begin again the next spring/ early Summer (depending on what climate you live in). Think about this for your budget. Buying one of those organic herbs at a grocery store can be $3-$6 a time, and you may not use it all before it goes to waste and then in a couple weeks you buy more! If you planted one basil plant that usually costs $3-$5 at a local farmers market, it can last you for years! And you can just clip what you need as you need it so no need to feel bad about any waste :) Herbs will grow as big as their planter. So if you only want to tend a small amount of rosemary, for example- put it in a 4"-6" planter (only about $1 at Walmart- see below). But other herbs will grow into huge bushes- like basil and mint- and if you want to get your moneys worth, you can plant in a foot wide or bigger planter. Kale- this is a pretty long lasting plant. My kale has been a champ so far- in the picture below, the kale is just 3 weeks old! Also, you can plant kale in the spring and the fall for two growing seasons (it actually tastes better when affected by frost!) What is that in with the Kale, you ask? Baby basil and cilantro plants. I talked above about how herbs can come back each year, well I didn't know that when I planted and planted the Kale in where I had my basil and cilantro last year. We left for a weekend and when we came back I had all these herbs in with the Kale! I guess I will be transplanting them elsewhere and see if they survive. Chard- the most robust of plants (meaning it's really, really hard for you to accidentally kill it :)- or so I'm told and I haven't killed ours yet! Swiss Chard is in the same family as beets and rhubarb. It can have a ton of uses like braised with meat, steamed in a salad, in soups or stews, and so much more. Most of the planters you see pictured above were purchased from Big Lots or Walmart. I spent a total of $25 on all of my planters (2- 12" wide for $6 each, 1- 16" wide for $6, 2- 10" wide for $2.50 each, 2- 6" wide for only $1 each!). Make sure to buy planters that have holes in the bottom so the soil can drain well. Sometimes you can buy big ones, like for tomatoes, that don't come with holes- but you can easily drill them in at the bottom. Also, don't be afraid to recycle some old stuff. We turned this dumpster (that was extra behind our house when we moved in) into a planter. The top half is also now our compost bin (more on that in another post ;). You can even use old Tupperware containers if you like. Seriously- doesn't have to be fancy (says the girl who planted Kale in half an old trash can...we cleaned it out really well first :). Compost- If you don't make your own, you can usually buy some from a local farmer and sometimes Whole Foods. Mix half compost in with the dirt whether planting from seed or transplanting. Fertilizer- I know this is gross, but sometimes local farms give away their extra horse or cow manure! We actually get our fertilizer from a seller at our Farmer's Market (he uses chicken manure because he raises them). If you don't like the thought of going to buy that and loading up your truck with it for the ride home, then Lowe's and Home Depot sometimes will have organic fertilizer choices. They are usually pretty helpful there with gardening questions, too! We mix a little fertilizer down with the compost and dirt below the plant. Then another thin layer of dirt, then plant, and then sprinkle the fertilizer around the topsoil making sure to not put it touching the plant. I'm not sure why, but the wise old gardener at the Farmer's Market told me to not touch the fertilizer directly to the plant, so I don't- have no reason other than that! Finally, water- which should be free! Plants need a lot more water during the first weeks than they do when they have matured. Hope this has been helpful if you were thinking about gardening in any capacity. Even if you just plant one tomato plant on your back porch, and it gives you 20 tomatoes all summer- you have probably saved money and gained nutrients from eating very locally :) Stay tuned for more on Growing Your Own Food- an in-ground garden, composting tips, and more! Yes, I realize that after 3 months of being a "blogger of recipes" (I hesitate to use the term "food blogger" because that feels more professional than I am yet :) that I have only posted these baked goods- and they were a derivitive of another bloggers recipe! Kind of ironic that I have so few baked goods so far since I used to bake for a living! The inspiration for this recipe was simply that I was eating a pear with almond butter and it brought me back to my frangipane eating days. For those who aren't familiar with it, frangipane is an almond filling that is used in tarts, pastries (like an almond croissant), cakes, and other baked creations. However, the primary ingredients besides almond flour are usually eggs, and butter! I no longer eat butter and my husband is allergic to eggs. So time for substitutions! I have found in my muffin, quick bread, and cake baking that coconut oil is a good replacement for butter (which is used for structure and as a crisping agent in baked goods). Coconut or Palm shortening is also another great choice, however- I go for coconut oil most of the time because of the cost. But when I really want a buttery flavor to my baked goods I will do a combo of coconut oil and Earth Balance Spread (I use soy free). Oil and margarine do not have the same crisping effects as butter/ milk fat, but they seem to do the trick OK enough for this recipe. Also, I made this recipe with and without eggs (which makes it vegan) to show you the difference in finished product, see above pictures. These tartlettes are Breakfast-worthy. I had two for breakfast this morning :) If you want more of a dessert version, simply replace the applesauce with 1/3 cup of honey*, but check them in the oven after about 15 minutes because they will brown more quickly. - Bake for 20-25 minutes (unless using honey*). They should be browned around the edges. - If desired to remove from pans or ramekins, wait until they are completely cooled before de-panning. - Optional- brush with equal parts honey and hot water for extra shine (I use equal parts apple sauce and hot water and it gets the same effect). This will also keep them moist if they will be sitting out for a while. **You may substitute the pistachio meal and make this with all almond meal (=4 oz or 1 cup). Frangipane is traditionally made with almonds and sometimes pistachios- but I prefer the more complex pistachio version. But this would be just as good with all almond meal/flour. However, the pimento cheese you see on that little roll there is not, shall we say, super healthy:) Pimento Cheese is considered a Southern "comfort food". The main ingredients are usually a combination of cheddar cheese, mayo, and pimentos (cherry peppers). Two of those ingredients are never in my home, but the other day I was craving some comfort. So I made up this recipe which is mayo free and dairy free. This can also be made with a red bell pepper if you can't find a jar of cherry peppers in the store. **Nutritional yeast is not like what you might think of when you thing of normal yeast- it also is different form brewers yeast (even though "brewers yeast" may come up on a search for "nutritional yeast"- they are not the same thing). You can generally find nutritional yeast at Whole Foods, but if not- here is a link to buy it on Amazon. This is what gives it the cheddar-like taste.